Favorite Thanksgiving Dish and/or Tradition? I think Thanksgiving is the one meal of the year where everything tastes better if it’s touching on the plate. A little stuffing with some cranberry sauce, turkey topped with mashed potatoes and gravy, sweet potatoes crowned with green bean casserole. Mmmmm… And although I love it all, nothing says “Thanksgiving dinner” to me like stuffing. Pumpkin Pie or Apple Pie? Pumpkin. And can I be specific and request Pumpkin Praline? What is your cooking mantra? 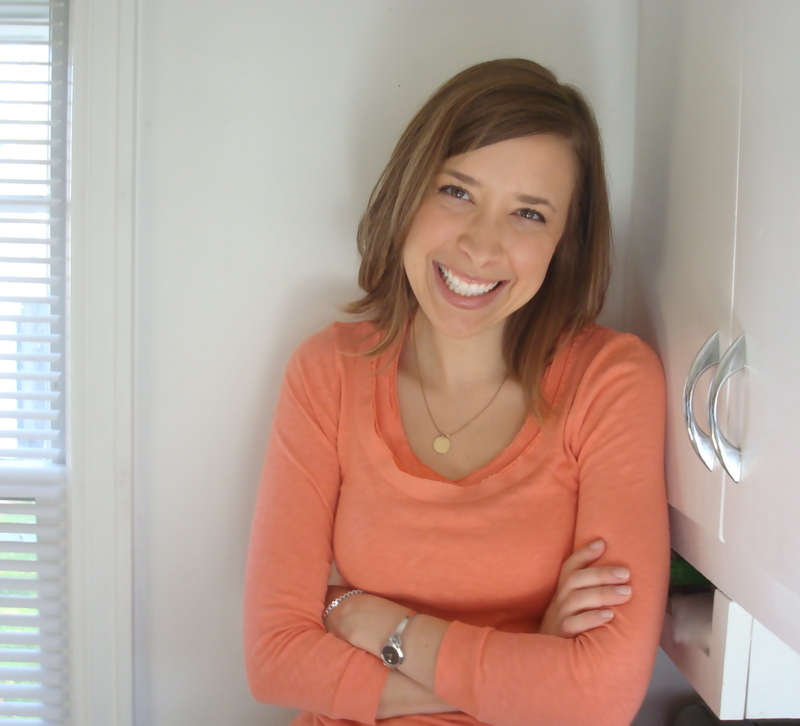 I write a little blog called Hot Dinner Happy Home. My mission there, and in life, really, is “Turning home into a haven, one meal at a time.” My mom, a very wise woman, always taught me that home should be your refuge. Cooking a meal (what my husband and I jokingly refer to as “hot dinner”) is one great way to help create that safe place, where you don’t need to change your shirt if you happen to spill gravy down the front. So, I hope that by sharing with you folks today, I can help you get one little step closer to turning your home into a haven. What are you thankful for this year? Oh, geez. There are so many things to be grateful for. I know this is going to sound completely cliche, but I am so thankful for the love and support of my family and friends. Knowing that you’re going at life as part of a team, and not as a lone soldier, is so comforting. Thanksgiving is in two weeks. Have you broken out in a cold sweat thinking about your Butterball? Given over to apple pie anxiety? Mumbled your menu in your sleep? Well, step back for a moment from the Thanksgiving stress that tends to overwhelm as the end of November nears. Take a deep breath and relax. Your mother-in-law might tisk-tisk if your gravy has lumps, but she’ll forget in time. Are you a bit calmer yet? Good. ‘Cause I’m gonna tell you the story of the best Thanksgiving ever. Turn back the clock a few years to November 2009. The husband and I are hosting our traditional “Transplant Thanksgiving” for those of us who don’t have immediate family in the area. The air is permeated with the perfume of the holiday: savory stuffing, sugary sweet potatoes, the spice of cranberry sauce and cider. The men are out in the garage where I relegated them with the turkey fryer and a bunch of beers. (“No, you cannot fry that thing in the house. I don’t care if it’s an electric fryer. It’s not safe. And it smells. No, seriously, take it outside. AND DON’T FORGET YOUR EYE PROTECTION!”) The ladies are in the kitchen, drinking wine and playing oven Tetris to make sure everything stays warm until the bird is carved. Finally we gather in the dining room. The table is bedazzled with plates and a mish-mash of silverware. The old folding chairs creak as we settle in, and I admire the happy commotion in my home: My sister and brother from out of town, friends we’ve grown to love like family, a co-worker rescued from heat-lamp turkey in the work cafeteria. It is group committed to loving each other, taking care of each other, and, today, feeding each other. This is Thanksgiving, and it is perfect. Tears spring to my eyes, and I’m like my mom during a Hallmark commercial, blinking hard, hoping no one sees me fix my running mascara. We shoved our faces full of food until everyone was uncomfortable. We circled the table and shared what we were thankful for. We poured each other drinks, even when our cups were full. And then we did the Cupid Shuffle in my living room with the blinds open. 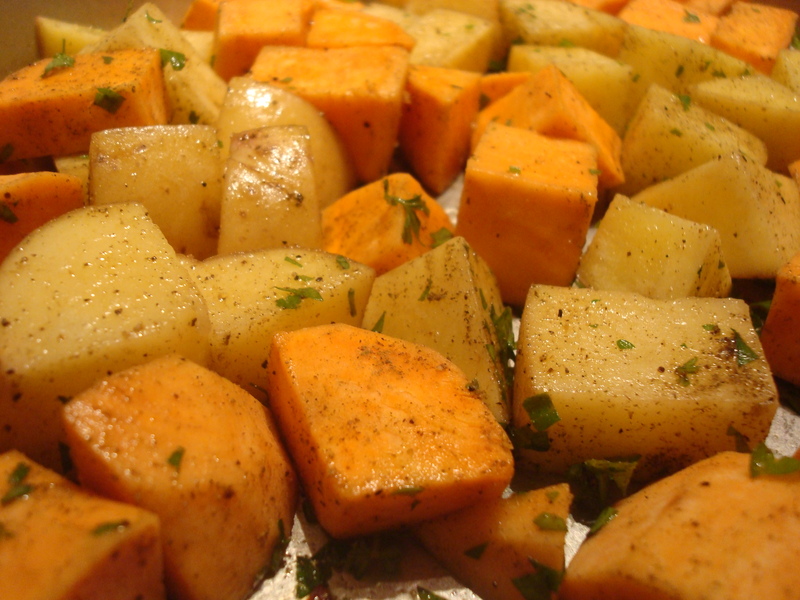 Can’t decide between white potatoes and sweet potatoes? Why not serve ’em both up this year? 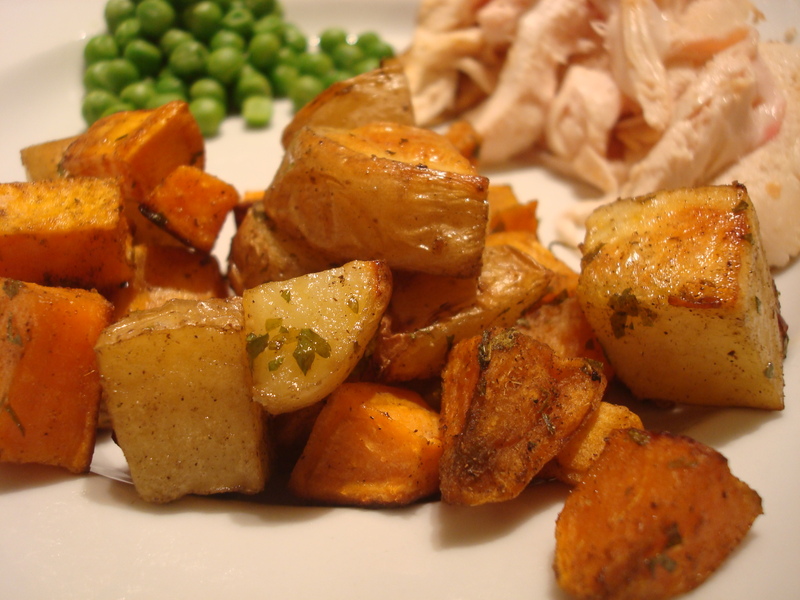 Partially cooking your spuds in the microwave will save valuable oven time. Also, this recipe cooks at 375 degrees, so it plays nice with other Thanksgiving favorites. Preheat oven to 375 degrees. Meanwhile, combine Yukon Gold and sweet potatoes in a large bowl. Microwave for 5 minutes, until potatoes are just barely starting to soften. Place partially-cooked potatoes on a very large (or two small) baking sheet with the garlic cloves. Drizzle with oil and sprinkle with thyme, parsley, red pepper flakes, salt and pepper. Using your hands, mix everything together so the potatoes are evenly coated with oil and spices. Bake for 40 minutes, flipping halfway through. Remove the garlic cloves and serve. It’s that time of the year again! Thanksgiving Potluck is back and this year we have five new fabulous bloggers to share their savory and scrumptious Thanksgiving dishes with us. So…welcome to our 2nd Annual Haute Apple Pie Thanksgiving Potluck table, we can’t wait for you to dig in! Favorite Thanksgiving dish and/or tradition: My favorite dish & tradition at Thanksgiving has & always will be…THE BIRD! I love Turkey more than most, and so does my family, so much that we always make 2 Birds to ensure we have plenty of leftovers to share! Of course the day of the Turkey is delicious, but there’s nothing I anticipate more than the late night Turkey Sandwich I make …thick sliced white bread, creamy mayo, crisp lettuce, juicy tomatoes, and you can not forget the sides….potato chips & a few dill pickles! Can’t wait! Apple Pie or Pumpkin Pie? You may as well be asking me to choose a favorite child! I am and always will be a Pie Girl, in fact, you can keep your Birthday Cake & put my candle in a pie! Apple Pie a la mode, sweet & creamy Pumpkin Pie…I’ll take one of each & take my chances on a stomach ache. 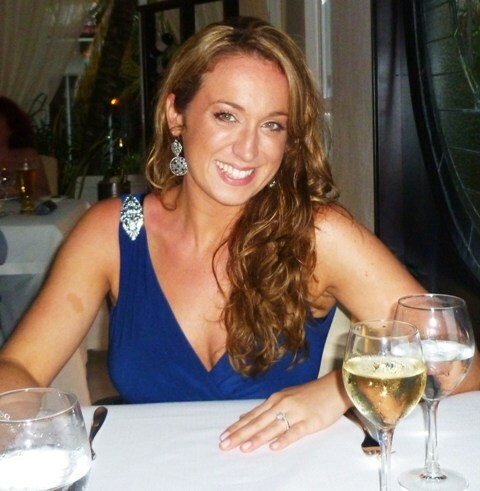 Cooking Mantra: My mantra is and always….Don’t be scared to Start from Scratch! What are you most thankful for this year? This year I am most thankful for family. I just got married to the love of my life this summer, and I must say it has been a year of excitement. I am thrilled to learn & share new traditions with his wonderful family, as well as start our own. We have a lot of love to give & are excited for the next step…our own family! Have a blessed Holiday Season everyone, hope you enjoy my recipe!! Something about nearing Thanksgiving always makes me crave the best flavors of fall…and there is nothing I enjoy more than a big bowl of Brussel Sprouts! These pretty little green veggies have made their way to being the next best thing to Broccoli, and I have a recipe that even the pickiest eaters can’t help themselves but be interested in. Once your guests have a bite of these sweet & savory sprouts, they’ll be ready to make a bee line for the brussels every time! Start by cleaning your brussel sprouts & slicing a small amount off the ends. Be sure to dry them off well and put aside while you prepare the rest of your ingredients. Slice your bacon into 1/4 inch thick lardons and set aside as well. Next in a small bowl melt your butter, and then add your olive oil, maple syrup, salt & pepper before whisking together. 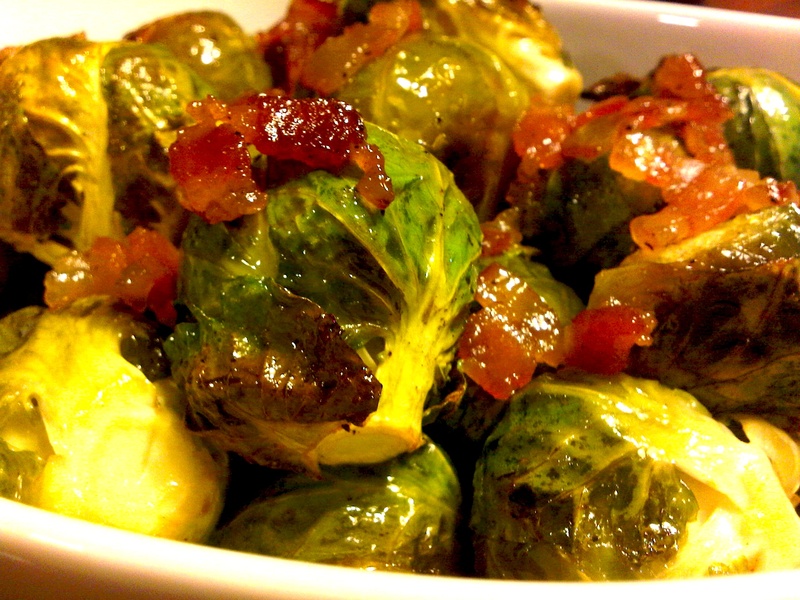 In a large bowl toss your brussel sprouts with the bacon & the remainder of your ingredients from the small bowl. Line a large sheet pan with heavy-duty foil to save yourself the trouble of scrubbing yet another pan, and carefully spread out your brussel sprout mixture & put them in the oven. Be sure to check your sprouts after 20 minutes to see how they’re doing & give them a toss, this will assure they cook evenly & don’t get too brown on one side. Depending on the size of your sprouts and the heat of your oven, they take about 30-45 minutes to cook through, create a syrupy coating, as well as get that bacon crisp & candy like. Serve warm with your TDAY spread & be sure to save yourself a little seconds, because sprouts like this don’t last for long! Happy Holidays Haute Apple Pie, ENJOY!